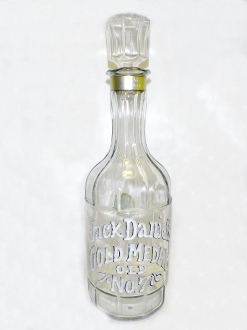 Jack Daniels 1904 replica of Gold Medal NO 7, 1/2 gallon bottle in excellent condition. Stands 15 1/2" high.There is a round label on back that reads: " Bottling No. 7, Taster ERS and initials JSN Master Taster" There is the gold band on top that reads:"Tennessee Whiskey 90 Proof Half Gallon Distilled and Bottled by Jack Daniels Distillery Lynchburg Tenn." There is the registered label from June 1973. Nice collectors bottle.